The Pinhouse Playmate: It's a kind of magic! Earlier this year, when I first got into spinning wool (and fell down a SERIOUS rabbit hole of creative possibilities), I learnt a bit about dyeing fibres with plants, fungi and lichens. As we all know, nature is the source of all that is wonderful and colourful, and seeing examples of what colours can be achieved from natural ingredients, made me want to have a go. 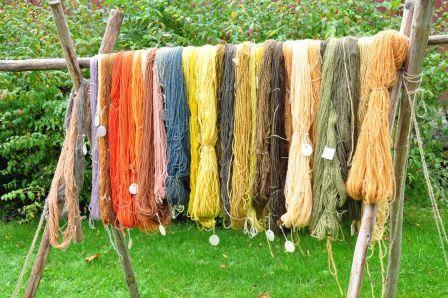 This is not my work, but lovely examples of plant dyed yarn. Photo gracefully borrowed from photographer Ingvild Hasle. 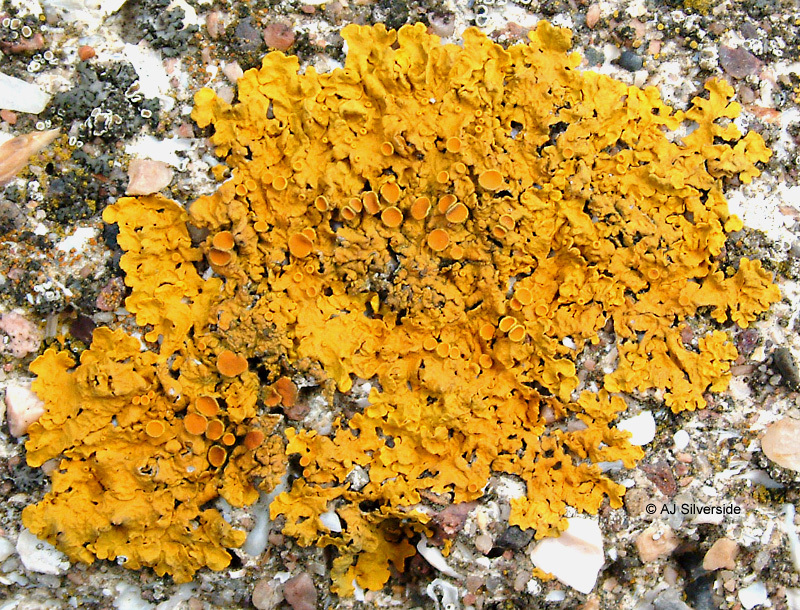 As it was late in winter at the time (February), the most likely source of plant material would be lichens growing on trees and rocks. 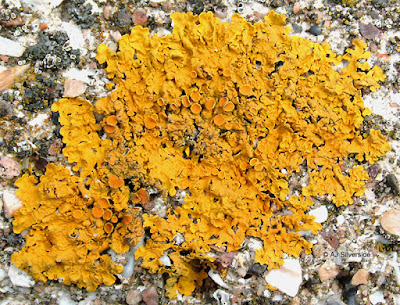 Besides being available all year, lichens (along with tree bark) also have the power to dye wool without mordanting. This is a preparatory process done to the wool , to make plant dyes more wash- and light fast, and is usually done with different metal sulphates (the most common of which is alum). Different mordants can also bring out different colour tones from the same plant, so they are very useful to produce a wider array of shades. Bear in mind, they are toxic and bad for the environment. I am always happy to skip steps to get to the fun part, so lichens it was! The only hitch to prove my point, was that the lichen would need to be fermented in ammonia for a minimum of 16 weeks, the jar needed to be turned every day blah blah. A very lengthy process! But as it so happened, I knew of a tree that was covered in the stuff, (or Xanthoria parietina as it is scientifically named) a bright orangy yellow crust (to my Norwegian readers, it's messinglav). I picked some lichen (70grams to be specific) off the tree (do this step in wet weather, as it softens it), and prepared a solution of 3:1 water and household ammonia. Then I stuffed a big mason jar with the lichen and topped it up with the liquid. So the experiment was live, and running. The first few weeks I was very diligent with turning the jar, but after a while it just sat there in the back of my kitchen cupboard. Come dyeing day some six months later, I didn't have much information to work with in terms of instructions. 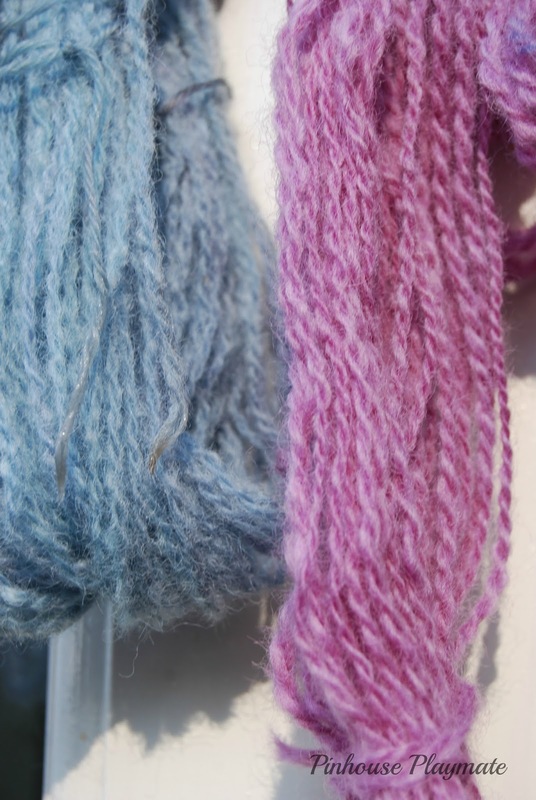 But the saying was that to produce the blue colour, the wool had to be dyed and then exposed to full sun,while being kept wet (sounds like a recipe for making those bad gremlins). 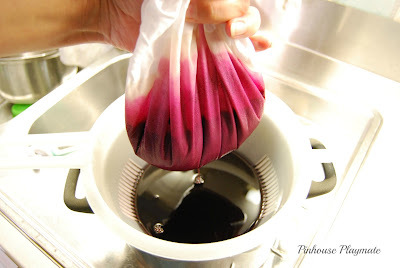 Firstly, I prepared the dye bath by pouring the contents of the jar (+1pint of water) into a cooking pot and brought it to a boil. Then I left it to simmer for about an hour (DO THIS OUTSIDE!!). I then strained it through a cloth, and threw away the lichen bits. I now had about 1 litre of very dark, smelly soup. I took half of it and diluted it with water (1:3). This because ammonia is though on fibres and can damage it if it's too strong. The wool I used was three small skeins of white handspun yarn, about 80 grams (this was just a test after all). The yarn needs to be soaked in water for at least 24 hours, and then added to the cooled down dye bath (the two should have the same temp). Bring it slowly up to no more than 90 degrees celsius, and keep it there for an hour. Do not stir or agitate. It is very important to watch the temperature. I used a cooking thermometer. And now for the magic! I took one of the skeins up from the pot after 45 minutes, and it was a bright pink. Ok, at least there was colour. The other two was left in the bath to cool. The sun was out, and I placed the skein in front of a mirror so the sun would be reflected upon it. I had a spray bottle with water handy, and made sure it didn't dry. 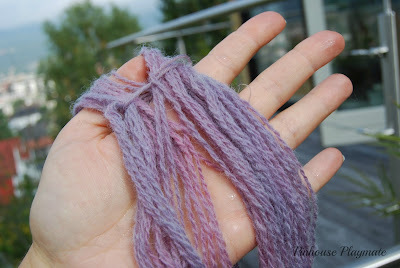 It instantly started to turn, from pink into purple, and in a few minutes the yarn was blue! During this transformation, the yarn needs to be turned, and spread to even the shade. But it was just stunning to watch. The process gradually slowed, but after 90 minutes my first sample was light blue with maybe a hint of green. I took up sample #2 and did the same. The colour shift was not as quick as with the hot yarn, but this did also turn. Hot skein straight out of the pot! how the mddle bits are still pink, and the colour more purple. sunlight exposure. And here are the results! Just to compare the difference sunlight makes. The pink is dried away from the sun, and will not turn blue. Who would have thought that a humble yellow crust could produce such stunning colours? 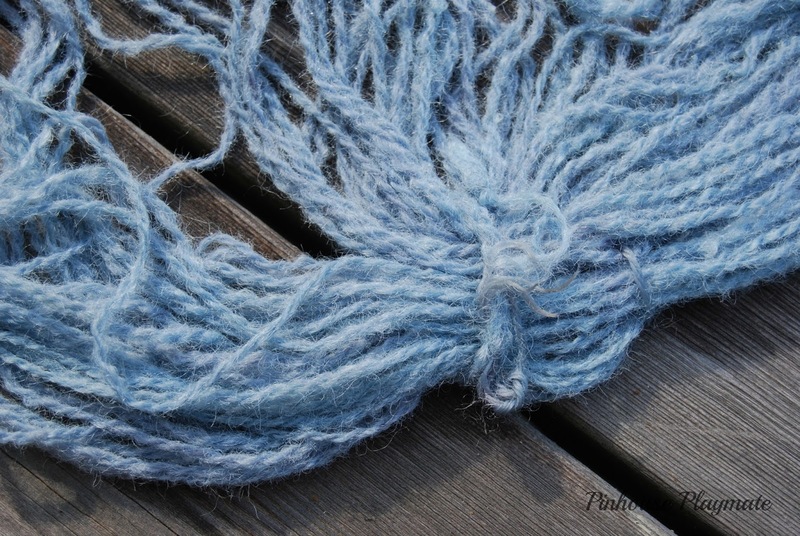 Have you ever tried dyeing with plants, lichens or fungi? This is sooooooo gorgeous! I just read about dyeing with avocado skins. I have not been this adventurous -- although lots of avocados means lots of guacamole! Now what are you going to make??? Thank you, Annie! Yes, you can dye with avocado, I have a big bag of skins and pits sitting in the freezer for that special day (be sure to scrub off all the flesh) :) I have a friend who has tried it, it wasn't a spectacular colour but still it's fun to have a go. 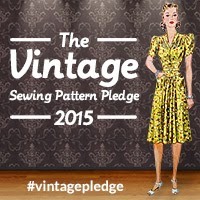 I have no idea what to make, it is not much yardage, but one can always use it together with other bits and pieces. Maybe a hat? Amazing!!! It's so great to not only knit something by yourself but also that you spun and dyed the wool as well! Thank you Suna! I think spinning is about breaking the code, when the threadling and stuff falls into place it all evolves quickly. As much as I love plant colour, I don't think it will be my go-to technique. It involves a bit of work, is seasonal, and not very good for the environment. I do acid dyeing mostly, it's convenient and done right, has little negative impact. And besides I just LOOOOOVE multicoloured, and that's hard to get with plant dyes. But it sure is fun! Wow, fascinating! Good for you. 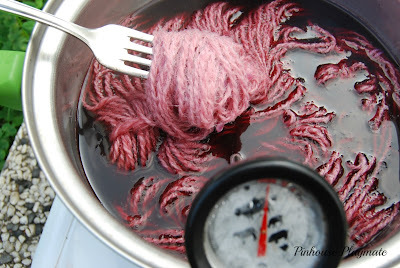 I love dyeing, but I really only use chemical dyes. No, Thank you ;) I wish you lots of luck! Jeg nyter dine beskrivelser på perfekt engelsk, samt din nøyaktighet til å følge oppskrifter, din nysgjerrighet, oppfinnsomhet. Fantastic! Wow!! This is brilliant! Yey for experimenting, and as I was reading this made me thing of the Potions classes in Harry Potter! Good luck with your next batch.